In the incinerating heat of Forteleza we witnessed the Mexican wave die down in the last minutes of a sweaty clash between Netherlands and Mexico. The heat favoured the Mexicans in the first half and it looked to be a Mexican fiesta as the dutch looked out of place. We saw the first of two cooling breaks in the World Cup with the mercury rising to above 40 degrees celsius and 38 degrees in the shade, even the fans felt the heat as they left their seats during the game to find shade. Goalless at HALFTIME. The heat seemed to be affecting the pace and energy levels of the players. After the halftime break The Mexicans got a goal through a snapshot from Dos Santos, his first goal in 2 years. The dutch began to find form as the sun began to move leaving more shaded areas over the pitch, Robben becoming his menacing self with runs from the left. The Mexican goalkeeper was man of the match for me with fantastic saves pity he was on the losing side today. With minutes left in the game Wesley Sneijder hit a cracker which Guillermo Ochoa could not save it would’ve burnt his gloves. The game looked like it was going into extra time but Robben would not have this as he earned his team a penalty in extra time with substitute Huntelaar converting making the final score…. NETHERLANDS 2-1 MEXICO , A dramatic late Dutch double sees the Netherlands through to WorldCup quarter-finals, a fitting celebration for Dirk Kuyt’s 100th game for Oranje. In the first ever meeting between Costa Rica and Greece in the World Cup finals it was set for an epic encounter, each team wanting to prove a point. With young Cambell the key man in the Costa Rican team they seemed to be the favourites to progress and this is what they did. Goalkeeper Navas was the deciding factor with some great saves during normal and extra time as the game ended 1-1 and went to penalties. With Costa Rica playing for most of the game with 10 men the Greek Gods could not capitalise on this and lost the game 5-3 on penalties. So the second quarter final of 2014 World Cup is set it will be Netherlands vs Costa Rica. This entry was posted in Uncategorized on June 30, 2014 by shaunjengel. So we have reached the 6th month of the year, where has the year gone? What have I achieved? Have I ticked off my new years resolutions? All these questions are always asked as we get closer to the end of the year and look back at the year that past, well look no further than inside yourself. You were the one who made the plans, so only you can answer the questions posed above. Speaking about milestones I would like to thank everyone for taking the time to read all the craziness that flows from my mind, blogging has taken me places if not physically but also spiritually it has opened my mind to the possibilities that is the FUTURE. Dream big and go for it, excellence takes time. I say we all are leaders we just need to believe in ourselves find that passion, ignite the flame and spread our wings and fly on…. I have reached the 100 post mark, and things are going good at work positive vibes all around, I feel blessed to share a little bit of myself with whoever reads, once again thank you. This entry was posted in Uncategorized on June 29, 2014 by shaunjengel. Chile had an amazing group stage as the underdogs to get through the group. With Brazil finishing top of their Group and joint top goal scorer Neymar holding the nations hopes on his shoulders it looked to be an exciting match. The fans went crazy when David Luiz put the ball into the net from a Neymar cross in the first half. Chile not sitting back and scored a goal of their own from Sanchez in the first half, it ended 1-1. The second half saw no goals in a tight contest no one giving way as this was an all or nothing encounter, you lose you go home. The game went into 30 minutes extra time, this is where the coach’s have to watch their players closely and tactics come into play with the dreaded penalty shootout looming. Brazil looked more likely to score in extra time but it was not to be with Chile coming close in the dying seconds of the game, Pinilla’s shot hitting the crossbar, this would’ve broken many hearts. Penalty shootouts it is after 120 minutes of intensity it all comes down to the goalkeepers who will it be to save the day, Bravo vs Cesar. It was Cesar who came out tops saving 2 penalty shots, it was close as Chile were 2-1 down to make it 2-2 and leaving it to the last shot to lose the game with an unlucky shot from Yara hitting the post and missing. So it is Brazil into the quarter finals, even Neymars hair felt the pressure though luckily it was only his hair that fell flat. BRAZIL 3-2 CHILE (PENALTIES) -BRAZIL move on to the quarter-finals after beating CHILE on penalties. Man of the Match BRAZIL vs CHILE: Julio Cesar. James Rodriguez scoring a brace with his first goal definitely on my list of Top 10 goals of the tournament. Great control off the chest and a perfect volley into the corner his 4th goal in 4 matches. His second goal making him top goal scorer at the tournament so far, Muller and Neymar behind him on 4 goals a piece. They are all still in the World Cup, should be interesting to see who takes the Golden Boot this year. The man of the match for me besides Rodriguez was the Columbian goalkeeper, keeping a cleansheet and making some fantastic saves a real match saving performance. With Uruguay out Suarez has alot to munch on…..
One quarterfinal matchup is set: BRAZIL vs COLUMBIA, Neymar vs Rodriguez. July 4th, its going to be a cracker. The knockout stages are really crunchtime I’m loving the beautiful game. This entry was posted in Uncategorized on June 28, 2014 by shaunjengel. GERMANY, GHANA, PORTUGAL and USA. Only two can remain after 90 minutes. Who will it be? With today being the last group games of the 2014 Fifa World Cup, We as Africans have 2 teams with the potential to join Nigeria in the second round. With Ghana up against a Portuguese team needing 5 goals to go through on goal difference if the USA lost to Germany it was more likely for Ghana to go through as all they needed was a win with help from Germany beating USA. With Germany winning the USA 1-0 from a Muller goal putting him joint top scorer at this years World Cup, it was looking good in favour of Ghana who were drawing against Portugal. Asamoah Gyan with his 6th World Cup goal is now highest-scoring African in finals, a draw would not be enough though but Ghana put on the pressure until, yes you guessed it Ronaldo, under performing at this years tournament managed to find the net and score his 50 goal for Portugal. In Group H, Belgium already through to the next round this was to be a game whereby Korea Republic needed to win to advance. On the stroke of half – time it looked like Korea were gifted a life line in the form of a Red card for Steven Defour who was sent off after a tough tackle on Kim Shinwook. This was not the case though as Belgium with 10 men managed to win the game through a Jan Vertnghen goal off the rebound after a save from Kim Seunggyu in the 78th minute. In the other game with 2018 World Cup hosts Russia needing a win to advance it looked set as they scored within 6 minutes with a thumping header from Kokorin. The game did not have much of an entertaining factor but in the 60 minute the Algerians equalised and held onto the draw, this being enough for the number 1 ranked African side to join Nigeria in the 2nd round. So we have come to the end of the group stages and now head to the business end of the tournament, with 2 African sides in the knockout stage will we see one of them bring back the gold, the stage is set for an amazing second half. To the teams that left I guess it’s back to the drawing board and time to rebuild. This entry was posted in Uncategorized on June 26, 2014 by shaunjengel. All eyes were glued to our screens as the Super Eagles were up against Argentina in the hopes of being the first African team into the last 16. It was Messi who shone with 2 goals to secure them top spot in Group F, fortunately for Africa Nigeria with 2 goals of their own from Musa, coming back twice from behind still went through as runners up. Is this the beginning of Messi finding his true form and will the Super Eagles sore into the finals, lets wait and see. 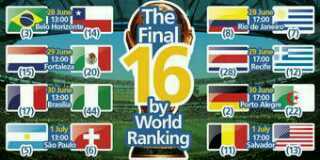 Welldone to our first African Team in the last 16. I think with the defensive play to hold Argentina to a draw made them cocky and they tried a different tactic in this game which did not work,.seeing Bosnia put 3 goals past them. In Goup E I was looking forward to another thriller from the French seeing that they lit up the tournament in their last game but they played to a 0-0 draw against Ecuador. The only highlight being Antonio Valencia recieving a red card either way they were going home. The other Group E fixture was more exciting though as we saw a Shaqiri hat-trick sealing second place in Group E & a spot in the next round for Switzerland! World Cup Fact: Shaqiri scores the 50th hat-trick in WorldCup history. The final score 3-0 against Honduras. Was it too early for the French Revolution, and will the Swiss Army run rampant in the next round only time will tell. CRC – Win group with win or draw. ITA – Advance with win or draw. URU – Advance with win. With these permutations the game to watch was Italy vs Uruguay and it did not disappoint they don’t call this the group of death for nothing. It took Uruguay 81 minutes to get the ball into the back of the net with a goal from their captain Godin, this securing their place into the last 16 and kicking favourites Italy out of the tournament. 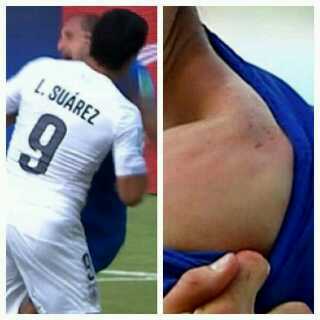 After the last game Suarez once again went from hero to zero, with a controversial bite on Italian player Chiellini. I don’t think being hungry for goals meant eating the players too. With Columbia already going through as group winners in Group C they will face Uruguay in the next round, luckily for Ivory Coast as we do not want a repeat of 2010 seeing that Suarez is back to his usual tricks. In the other Group D game, with England already out they made 9 changes to their starting line up, just like Spain I think they are building for Euro 2016. Costa Rica the surprise package of this group only needed a draw to go though to the next round and this is what they got. They finish the group as group winners. England would be happy to get away with one point and Rooney scoring his first World Cup goal, they also have some talented youngsters to build around. A draw will be enough to ensure top spot for Colombia. Greece, Ivory Coast and Japan can all still qualify! These are the permutations for Group C as a African obviously I’ll be supporting Ivory Coast and be hoping Drogba can get his goal to make him the first African player to score in 3 World Cup tournaments. A win for Ivory Coast would be a great consolation for the Toure brothers in memory of their younger brother who past away in Manchester last week. Both Greece and Ivory Coast looking for a win to see them move to the round of 16 for either of them. Karagounis vs Drogba two veterans who would take thier team into the next round? It was Greece who struck first in the 33rd minute with Toure’s corner cleared away, counter by the Greeks. Cholevas’ effort hits the post from range the Greek Gods looked to be favouring the Ivorians. In the 42nd minute though the tables turned with a Samaris goal if the scoreline stayed 1-0 Greece would go through to the next round. Second half saw Ivory Coast pile on the pressure will it be enough. This pressure was rewarded with a goal in the 74th minute by Bony. With Japan out of the running to go through to the next round a draw would favour Ivory Coast but it was not be as a controversial penalty in the 93rd minute gave Greece the winner. A sad day for Africa so close, can Ivory Coast become the first African team through to the next round? – This was the question at the start of the game answered with a no at the end of the game. Final score 2-1 to Greece. Columbia already through to the next round would be looking for a draw, but a penalty in the 17 minute gave them the lead with a beautiful straight strike from Cuadrado. Columbia decided to go for all 3 points after the break with Jackson Martinez putting Colombia back in the lead, firing into the lower corner in the 55th minute. In the 82 minute Martinez got a second putting the game out of reach of the Japanese players. This entry was posted in Uncategorized on June 24, 2014 by shaunjengel. Nani scoring after 5 minutes, the USA came back to make it 2 – 1 this would’ve meant another early exit for Ronaldo and the boys but Silvestre Varela scored a last-gasp equaliser as Portugal forced a 2-2 draw with the USA for their 1st point of the tournament. It is still all to play for as we go into the final group matches, all depends on the result in the game between USA vs Germany a draw would mean both Ghana and Portugal would be out. Day 13 saw the start of the final games in the group stages with both games in group B kicking off at the same time all eyes were on the Netherlands to see how far they could take their goal tally in the tournament so far, they certainly did not disappoint with a 2 – 0 win over Chile. Netherlands were twice losing finalist against Germany and Spain respectively, will this year be third time lucky. With the mixture of youth and experienced players they are looking dangerous with ‘old man’ Kuyt getting on the scoresheet against Chile. It was a game of pride with both Australia and Spain looking for their first points in this years tournament. With 7 changes to the Spanish starting line up, I said in my last post that the Spanish bench looks like another first team and this showed as they looked like the Spanish team we all love putting 3 goals past the Socceroos. Villa, Torres and Mata with the goals. It was Villa’s last match as he retires as Spain’s record scorer with 56 goals. I guess it doesn’t MATA though as both teams are out. Now our focus turns to Group A to see who will play Netherlands and Chile in the round of 16. With Cameroon having nothing to play for, already being eliminated they certainly did not come into this game lying down. After their messy last game the indomitable lions needed to restore some African pride but the Brazilian wonder boy was too much for them scoring 2 beautiful goals. The Estádio Nacional Mané Garrincha in Brazilia was a sea of yellow, it looked like the only Cameroon support came from their substitute bench. It was Brazil’s 100 World Cup game and who better to score the 100 goal of this years tournament than Neymar with the whole nation’s hope on his shoulder he is certianly living up to that expectation. Joel Matip leveled things up after Neymar’s fisrt goal making it 1-1 , scoring his first international goal silencing the Brazilian fans, if only for a few minutes though as Neymar scored his second goal. The Croatia vs Mexico game looked like it was not living up to expectation with a tense first half, no one breaking the deadlock as the score ended 0-0, if it stayed that way it would favour the Mexicans. The second half was more entertaining though as Mexico scored 3 goals in 11 minutes with the United man Chicharito getting on the scoresheet after coming on as a super sub, making that the 6th United player to score at this World Cup. Croatia managed to pull a goal back though in the 87th minute but then had a player sent off after a reckless challange this did not matter though as Brazil and Mexico go through to the last 16 to meet Chile and Netherlands respectively. This entry was posted in Uncategorized on June 23, 2014 by shaunjengel.